Am I the only runner who has ever gained weight when training for a marathon? Why does my husband lose weight when he starts running and I don't? For all the exercise I do, I should be pencil-thin. 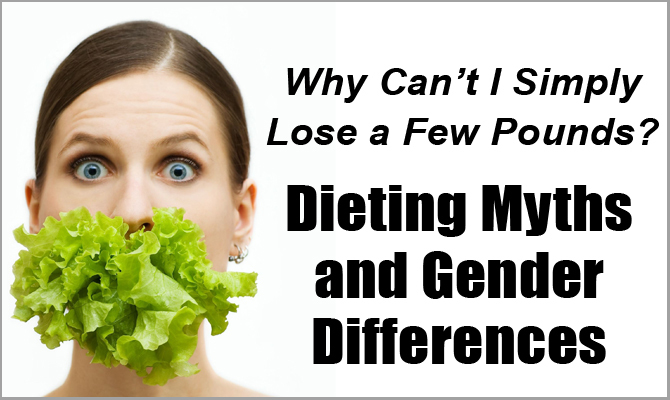 Why can't I simply lose a few pounds? Clearly, weight loss is not simple and often includes debunking a few myths. Perhaps this article will offer some insights that will lead to success with your weight loss efforts. Myth: You Must Exercise in Order to Lose Body Fat. Adding on exercise does not equate to losing body fat. In a 16-week study, untrained women (ages 18 to 34) built up to 40 minutes of hard cardio or weight lifting three days a week. They were told to not change their diet, and they saw no changes in body fatness (1). Creating a calorie deficit by eating less food seems to be more effective than simply adding on exercise to try to lose weight. Runners who complain they “eat like a bird” but fail to lose body fat may simply be under-reporting their food intake. A survey of female marathoners indicated the fatter runners under-reported their food intake more than the leaner ones. Were they oblivious to how much they actually consumed? (2) Or were they too sedentary in the non-exercise hours of their day? Myth: If You Train for a Marathon or Triathlon, Surely Your Body Fat Will Melt Away. Wishful thinking. If you are an endurance athlete who complains, “For all the exercise I do, I should be pencil-thin,” take a look at your 24-hour energy expenditure. Do you put most of your energy into exercising, but then tend to be quite sedentary the rest of the day as you recover from your tough workouts? Male endurance athletes who reported a seemingly low calorie intake did less spontaneous activity than their peers in the non-exercise parts of their day (4). You need to keep taking the stairs instead of the elevators, no matter how much you train. Again, you should eat according to your whole day's activity level, not according to how hard you trained that day. Myth: The More Miles You Run, The More Fat You Will Lose. Often, the more miles you run, the hungrier you get and 1) the more you will eat, or 2) the more you believe you “deserve” to eat for having survived the killer workout. Unfortunately, rewarding yourself with a 600-calorie cinnamon roll can quickly erase in a few minutes the 600-calorie deficit you generated during your workout. Myth: You Should Run Six Days a Week to Lose Weight. Research suggests exercising four times a week might be better for weight control than six times a week. A study with sedentary women (ages 60 to 74) who built up to exercising for 40 minutes of cardio and weights suggests those who did four workouts a week burned about 225 additional calories in the other parts of their day because they felt energized. The group that trained six times a week complained the workouts not only took up too much time, but also left them feeling tired and droopy. They burned about 200 fewer calories in the non-exercise parts of their day (5). Yes, they were ages 60 to 74, but the info might also relate to you? Myth: Couples Who Run Together, Lose Fat Together. Not always. In a 16-month study looking at exercise for weight loss, the men lost 11.5 pounds and the women maintained weight, even though they did the same amount of exercise (6). In another study, men who did an 18-month marathon training program reported eating about 500 more calories per day and lost about five pounds of fat. The women reported eating only 60 more calories, despite having added on 50 miles per week of running. They lost only two pounds (7). If you are running to lose weight, I encourage you to separate exercise and weight. Yes, you should run for health, fitness, stress relief, and most importantly, for enjoyment. (After all, the E in exercise stands for enjoyment!) If you run primarily to burn off calories, exercise will become punishment for having excess body fat. You'll eventually quit runningand that’s a bad idea. Instead of focusing on exercise as the key to fat loss, pay more attention to your calorie intake. Knocking off just 100 calories a day from your evening snacks can theoretically result in 10 pounds of fat loss in a year. One less cookie a day seems simpler than hours of sweating...? Nancy Clark MS RD CSSD (Board Certified Specialist in Sports Dietetics) counsels casual and competitive athletes in her private practice in the Boston-area (617-795-1875). Her Sports Nutrition Guidebook, Food Guide for Marathoners and Cyclist's Food Guide all offer additional weight management information. The books are available via www.nancyclarkrd.com. See also www.sportsnutritionworkshop.com. 1. Poehlman, J Clin Endocrinol Metab 87(3):1004-9, 2002.